Johnny Depp, 38, got his break in A Nightmare on Elm Street in 1984. 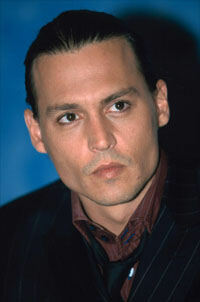 He has played an array of marginalized characters, notably the title role in Edward Scissorhands. Depp's latest film is From Hell, in which he plays a policeman on the trail of Jack the Ripper. After relationships with Winona Ryder and Kate Moss, he has settled with the singer and actress Vanessa Paradis. They live in Paris, and have a daughter, Lily-Rose. Why do you think the public is still so fascinated by the story of Jack the Ripper? Obviously the fact that the case remains unsolved means that it retains its mystery. It's an amazing story. Also, it's just so horrific, so grisly. It's mind-blowing that there are so many theories about the case. The Ripper was certainly the first serial killer to gain so much international attention and, in a perverse way, to be elevated to the status of celebrity. This case marked the birth of the tabloids. You play a very convincing Cockney. How difficult was it to master the accent? Thanks. There were a couple of guys I looked to for this accent. It was mostly Keith Richards, but with a bit of Pete Townshend thrown in. You've said that your life began after the birth of your daughter Lily-Rose. What is she like now she's a toddler? How have you changed as a person since your daughter was born? It's funny, because it feels like the day Lily-Rose was born was in a way the day I was born. I feel that she gave both Vanessa and me life, like a fog had lifted and suddenly we had clarity. It's a very profound moment when you meet your reason to live, and you didn't even know about it before. What my daughter did to me is pretty amazing. Has she shown any signs of creativity? Yeah, it's fantastic. She started making drawings between the ages of three and six months. Then, by the age of one she was painting, not just watercolors, but acrylics. It's fascinating to watch this tiny human being expressing herself, putting paint on to the canvas and sticking the brush in the water, cleaning it off and going for another color. I hope she'll be a great painter some day, not an actress. You've always had an interest in music—how is that coming along? Music is a great passion for me. It got me through the horrors of puberty. But these days I just do it for pleasure. My music career is over, although it's still one of my first loves. You seem to have steered away from commercial roles and opted for more quirky and darker parts. Do you plan your career? Did you make a conscious choice to shy away from big-budget projects? It's not that I shy away from commercial projects. It's just that I never considered being a “movie star.” I think being a movie star would get in the way of being an actor, which is why I don't go for the bigger roles. But boy, it's hard turning down that money! What attracts you to playing real-life characters? It's less work. But generally I like playing both real-life characters and characters that you get to invent from the ground up. You do feel you have more of a responsibility when you are playing a real person. For instance, when I played the part of [the cocaine dealer] George Jung in Blow, I felt a deep sense of responsibility. However, when you play a fictional character you also feel a responsibility to that character's creator. When I was playing Raoul Duke in Fear and Loathing in Las Vegas, I was afraid that Hunter Thompson would sneak up and attack me. My idea of heaven is my family—my daughter, my wife, basically my girls, being away from everything and knowing that they are safe. From Hell opens nationwide on 8 February.